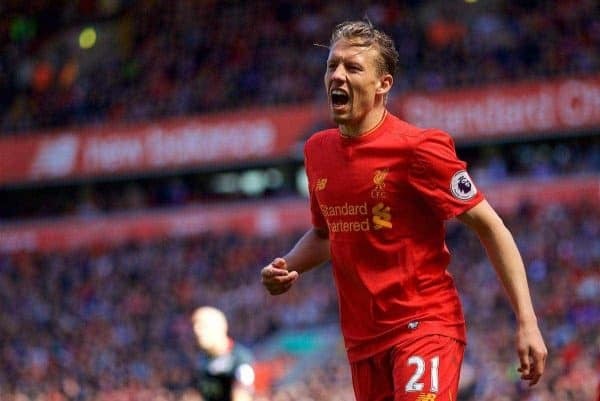 Brasileirao Serie A side Gremio are plotting an attempt to re-sign midfielder Lucas Leiva following his release from Liverpool earlier this month. The Brazil international spent 10 years at Merseyside where he remained a crucial player in the first-team squad. Though his appearances were reduced last season, Jurgen Klopp used him as a utility player in the central defensive department when the club was short of sufficient options through injury. Since his release, the likes of Newcastle United and Brighton & Hove Albion have been credited with an interest with the former currently under the management of ex-Reds boss Rafael Benitez, who brought him from Gremio 10 years back. Lucas is currently back in his home nation of Brazil in order to attend the wedding ceremony of compatriot Roberto Firmino. The former Reds midfielder is said to have plenty of options to prolong his career in England, but a return to Gremio looks a huge possibility after he admitted that he had received a winter offer from his former club. Lucas had been tipped to leave for Galatasaray during the previous summer transfer window before he decided to stay put at Liverpool for the campaign.